About two weeks ago, Barnes and Noble’s online store had a brief sale on their edition of the recently published Sock Yarn One-Skein Wonders: 101 Patterns That Go Way Beyond Socks! (Note: The B&N edition has five extra patterns. If you don’t manage to get this version of the book, don’t sweat it–the bonus patterns aren’t that thrilling.) A flurry of e-mails passed among members of my knitting group that evening, and the upshot is that one of my friends kindly ordered an extra copy of this book, which I got for the great price of $2.99. A week later I saw her and swapped three bucks for the book. I’m still feeling a bit traumatized after the latest Exploding Sock Event, and since nearly all of my sock-yarn stash is 100% wool, I was hopeful that I’d find a nice not-sock project for that fiber in this book. And I did! The lovely Ericka scarf fit the bill! It has a simple, easy-to-remember stitch pattern. Paired with some Socks that Rock yarn, it made for a very lovely, drapey scarf indeed. And then I got to That Point. You know the one: the “am I going to have enough yarn for this?” point. I put the rest of the ball on our kitchen scale and discovered that I had just a little over half of it left…and my scarf was only twenty inches long. I am not a fan of short scarves–this sucker had to be sixty inches long or else. Looking at the pattern again, I see where I went wrong. The pattern calls for 100g ball with something like 450 yards. I had checked the weight of my Socks that Rock (100g! Hooray! It matches!) but neglected to check its yardage, which is not even 350 yards. Crap. So I took a little trip to Frogville. Now I’m trying to figure out what else to do with this yarn (which handles beautifully and doesn’t do any weird pooling). Suggestions? 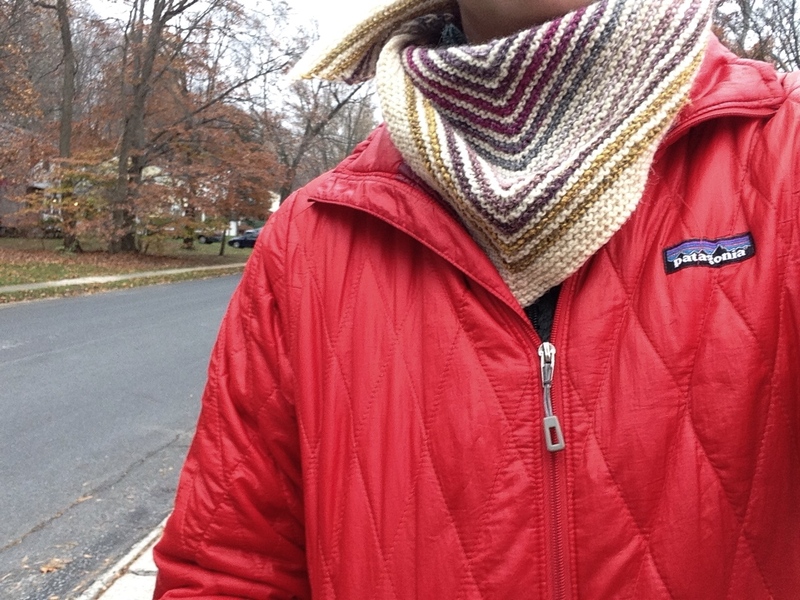 This double-sided cable scarf has one cable down the middle–a great project for anyone approaching cable knitting for the first time and with trepidation. If knitting lots and lots (and lots) of I-cord won’t drive you mad, this I-cord scarf may be just the ticket for you. The Coal Springs scarf is knit in the round (in a tube) and, according to the author, offers a great introduction to two-color knitting. I think it looks pretty spiffy. This waving chevrons scarf was originally knit in three colors of worsted, but I wonder how it would look in a variegated yarn. For the little ones, here’s a kid-sized snake-themed keyhole scarf that looks awfully fun. If you’re more of a cowl person, check out this pattern, which offers basic instructions for knitting a simple cowl in pretty much any weight of yarn. And if you’re a cowl person who doesn’t want to drop $750 on a Burberry design, check out this DIY version. I’m not the biggest fans of cowls, but this one may make it onto my to-knit list. Remember that Baktus scarf I made last fall of two not-quite-full skeins of Koigu? Sylvia has taken to wearing it–which is great, because it’s the perfect size for her. During last month’s heavy snowfalls, she spent a lot of time playing outside in the snow. Her pre-play preparations including putting on four layers of clothes* and finishing up with this scarf. After one outside excursion she came back inside only to discover that the scarf was missing. We looked in the yard and even revisited the small hill on the next street (where we’d tried sledding that day) but didn’t find it. Sylvia was a bit unhappy, but I was fairly certain the scarf was somewhere in the yard and would turn up eventually. Lo and behold, as Jan and I were building a castle (complete with a snow bench long enough for all three of us!) in the front yard a week later, look what we found! *I know this may seem like overkill, but she’s not shoveling (and therefore not building up a lot of heat), and she does spend most of her time sitting or lying on the snow (so waterproofness is key). 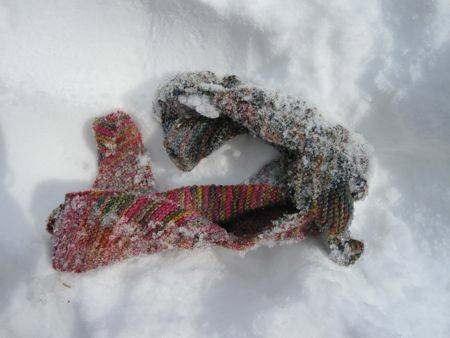 Apparently the Baktus scarf was all the rage last year among Norwegian knitters–and the non-Norwegians who read the Norwegian knitters’ blogs. I heard about it only recently, when my friend JD posted about it on her blog. I thought about alternating the two colors every two rows but decided against it, preferring instead to have two big blocks of color. I love how it looks! This pattern is very easy to memorize, which makes it excellent for mindless knitting. I like it so much that I’ve already cast on another one–this time using two 50g balls of sock yarn, so I’m hoping it will be a bit longer than my first one. Incidentally, this is the very time I’ve ever knit with Koigu. Finally, I understand what all the fuss is about. I’m not ready to run off and join the Koigu Cult*, but wow, that stuff is really nice to knit with. *Two reasons: (1) I can’t afford to knit with Koigu; and (2) most non-accessory garments (e.g., sweaters) knit with Koigu look like a paint shop exploded all over them (and no, that’s not a good thing). Last June I received a wonderful, yarn-filled package from Karen at Yarn Is My Métier. Almost immediately I cast on for Karen’s Mia Shrug (there’s a pattern link on the front page of her blog), using the Jaegar Shetland Aran. It is a lovely pattern (clear instructions! fun to knit! ), and the completed shrug was sent—before I remembered to photograph it, alas—to my friend Valérye in Australia. What to do with the Jo Sharp Silkroad Aran, though? 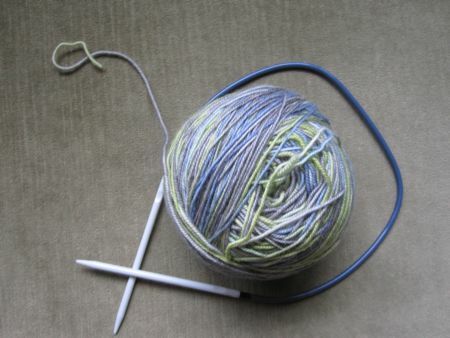 This is really luscious yarn—the sort of thing I wanted to use for something that would be used for a very long time. About a month ago, I realized that in nearly five years of knitting I had yet to knit a scarf for myself. (Gasp!) I couldn’t believe it. So I started looking at scarf patterns. Plain stockinette or garter stitch were out (too boring), as were cables (ate up too much yarn). And then I remember Wavy, from Knitty’s winter 2004 issue. 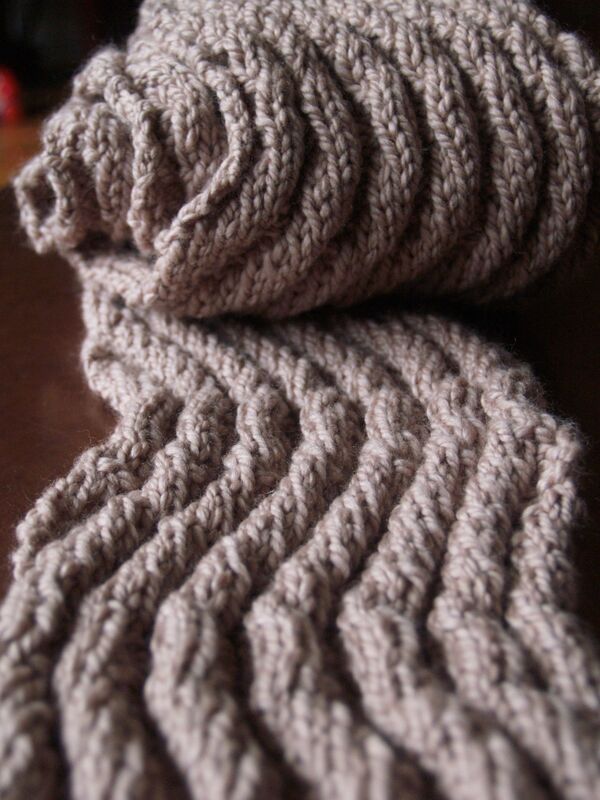 I’d actually knit this scarf once before as a gift for a friend and had really enjoyed the pattern. * The result is slightly funky, not full of holes (lace scarves are not my thing), and easily dressed up or down. *I did most of the knitting during the four hours I had to sit in a Quest diagnostics lab office while doing a glucose tolerance test for gestational diabetes. I’d flunked the “quickie” test my midwife gave me at the birth center, so I had to spend half a day drinking a sickly sweet orange solution, waiting an hour, getting my blood drawn, then repeating the whole sequence a few more times. This knitting project and an audiobook kept me from going nuts in the waiting room. And I passed the test with flying colors, fortunately! After finishing the B.O.B. Sweater, I decided to knit a scarf for myself. I’ve had a copy of Scarf Style from Interweave for some time, and whenever I look through it I find that I like patterns that I disliked the last time, and dislike those I liked the last time. So as you can imagine it’s hard to me to settle on any project from this book. This time, though, I had just finished looking through my stash, and when I came across the Midwest Moonlight scarf (Ravelry link here) I remembered that I had the exact yarn it called for: Cotton Comfort, from Green Mountain Spinnery. I love this yarn. I’d bought five skeins of it on a trip to Vermont a couple of years ago and used about two-and-a-half skeins for a baby sweater. The scarf pattern calls for three skeins, but I figured that two and a half would be fine. I don’t really need a scarf that’s seventy-two inches long. Nor do I need a scarf that’s full of holes, apparently. 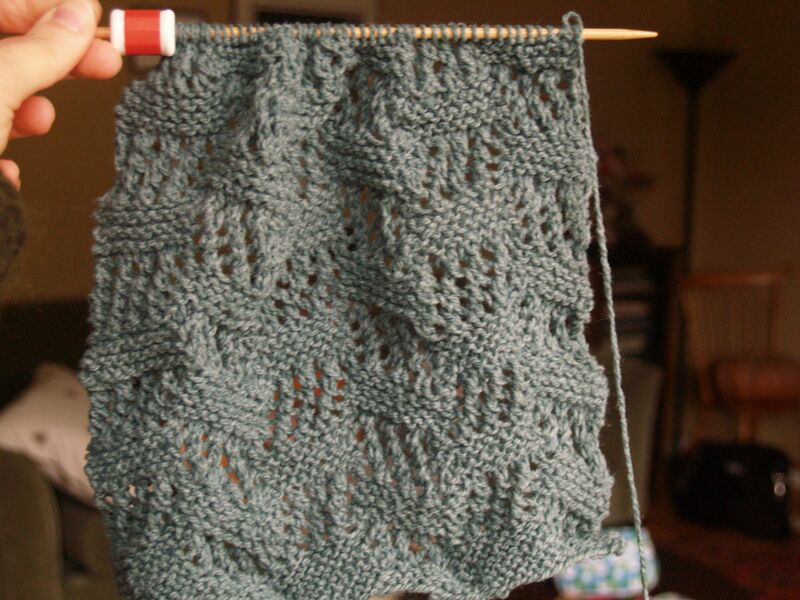 This is technically a lace pattern, with yarnovers and k2tog and ssk all over the place. But it seemed substantial to me—certainly not flimsy lace. After knitting several inches of this scarf, though, I’m finding that I just don’t love it. It’s pretty enough, but just not me. And I firmly believe that, considering how limited my time is for all the things I want to do, I don’t want to waste any of it on something that I don’t really like. So I’m frogging this sucker. Via Craft, I recently rediscovered a pattern I’d first encountered last winter via my SP8 downstream pal’s blog. 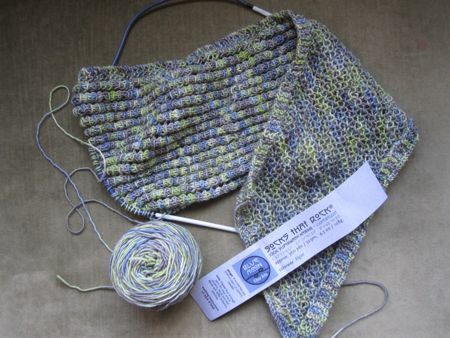 It’s for a double-sided star scarf that looks awfully fun to knit. I’m thinking about giving this a try with a different motif or maybe even a set of motifs. 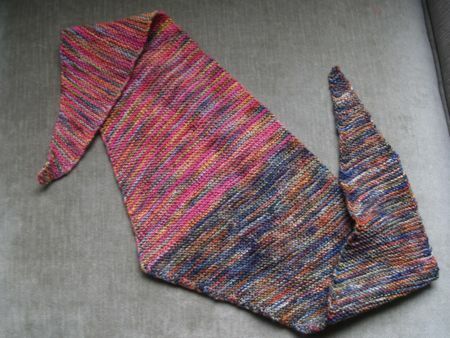 And here’s another scarf pattern—this one a foulard—from Topstitchgirl. She writes her blog entries in both English and French, so here’s a fun chance to try knitting from a pattern in another language (with as-needed peeks at the other), if you’re interested. I couldn’t stop laughing when I first saw this O RLY scarf. If you want to know what’s so funny, check this out. Yes, I wear my geek badge proudly! Here’s a lovely pattern for a scarflet that fastens with buttons. Me, I’m more of a long-scarf person—something that be wrapped around your neck a couple of times—but I do think this is a nice design and could work very nicely (perhaps in a luxury yarn?) for something a bit more formal.